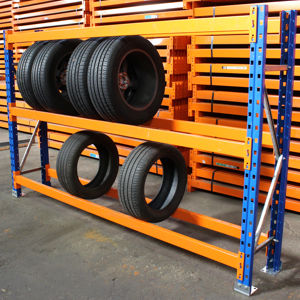 As specialists in used pallet racking, this will always be our most popular form of warehouse storage, but these racking systems are adaptable and can be used in a number of different ways. Timber or wire mesh decking can be added to act as support for pallets, but this can also be used as heavy duty shelving for non-palletised items or picking levels. The depth of pallet racking can be adjusted to be used as tyre racking and racking bays can also be arranged back to back to create carpet racking. As well as new and used pallet racking we also have huge stocks of longspan shelving and we can supply bespoke cantilever racking for long items such as pipes or timber. We can deliver to any UK mainland address, so whether you are in London, Cardiff, Edinburgh or Leeds call us now on 0800 612 3210 for a great price. Or you can send us a message using the enquiry form and we will reply to you quickly.